What are the misspellings for Jane? 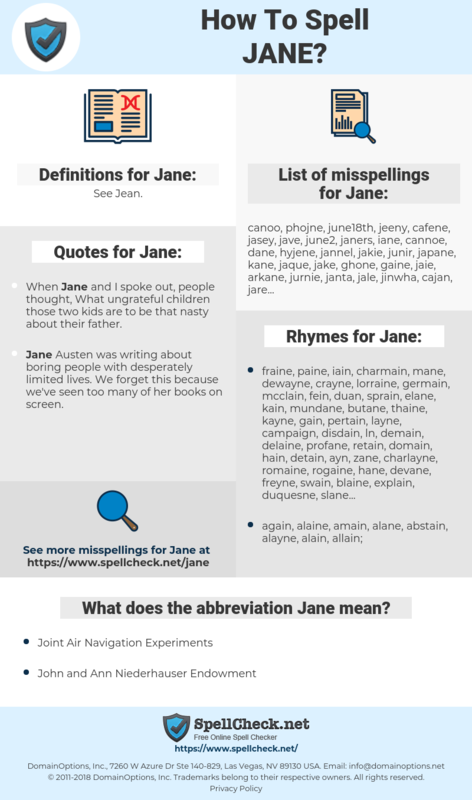 What are the common mistypes for Jane? What is the definition of Jane? What does the abbreviation Jane mean? What are the quotes for Jane? What are the rhymes for Jane? What are the translations for Jane? 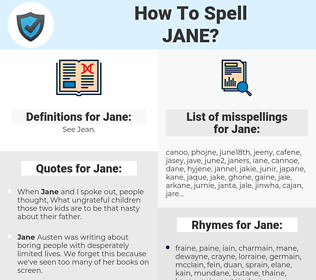 What are the common typos for Jane? Jane as a girl's name is pronounced jayn. It is of Hebrew origin, and the meaning of Jane is "God is gracious". Originally a feminine form of John. A longtime popular girl's name. It is not a royal name, but has been borne by the 16th century's Lady Jane Grey who was unwillingly proclaimed queen. It was influenced by the 19th-century use as the name of the central character in Charlotte Bronte's "Jane Eyre". In the 1940s, the name was borne by statuesque American film celebrity Jane Russell. Often used as a middle name, Jane is also the basis of many variants and as the second element in combinations such as Sarah-Jane. See also Jenny, Jiana, Seana, Sian, and Siobhan. Author Jane Austen; actresses Jane Fonda, Jane Seymour, Jayne Mansfield, Jane Wyman, Janeane Garofalo, Jane Kaczmarek; TV newswoman Jane Pauley. This graph shows how "Jane" have occurred between 1800 and 2008 in a corpus of English books. I do hope to bring Jane Whitefield back before too long. I remain loyal to Bach, Mozart, Beethoven and Schubert in music and to Shakespeare and Jane Austen in literature.